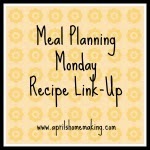 Time again for this weeks meal planning Monday. I always enjoy looking through everyone's posts, there are so many wonderful and creative recipes! This week I am sharing my recipe for Marmalade Raisin Tea Bread. I love orange marmalade, and this is a wonderful bread with a sweet marmalade glaze that goes perfect with a cup of tea. Definitely a welcome afternoon snack, and also perfect to serve for a brunch! Thanks for hosting! I'm sharing my favorite recipes for kid-friendly stuffed muffins and tomato onion jam. Thanks for this link up! I love it!